World Architecture Festival (WAF) concluded a four year run in Singapore in November. WAF is the world’s largest international architectural event. It includes the biggest architectural awards programme in the world, dedicated to celebrating excellence via live presentations to delegates and international juries. In November of 2016 WAF is being relocated to Berlin, Germany. On the following pages, PRC Magazine presents a selection of noteworthy completed projects, all winners of their category of nomination. The Interlace, a vertical village in Singapore, has been crowned World Building of the Year 2015 at the World Architecture Festival. The residential development, designed by Ole Scheeren of OMA/Buro, is a radically new approach to contemporar y living in a tropical environment. 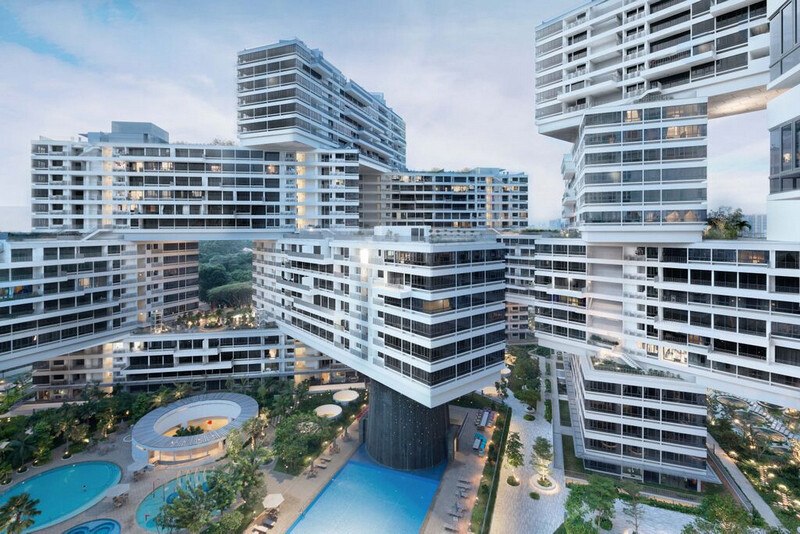 The Interlace is one of the most ambitious residential developments in Singapore’s history, generating an intricate network of living and social spaces intertwined with the natural environment. Instead of following the default typology of housing in the region – clusters of isolated towers – the vertical is turned horizontal, with 31 apartment blocks, each six stories tall and 70 meters long. The stacked formations allow light and air to flow through the architecture and surrounding landscape. Developed by Capitaland and Hotel Properties Limited, With a GFA of 170,000 m² The Interlace will house 1,040 apartment units of var ying size. Stacked in hexagonal arrangements around eight large-scale open permeable courtyards, the scheme creates a network of internal and external environments that create a multitude of shared and private outdoor spaces on multiple levels. The large-scale complex takes a more expansive and interconnected approach to living through communal spaces which are integrated into its lush sur rounding greenbelt. Landscaping at The Interlace takes up eight-hectares, with the arrangement of the buildings maximizing the presence of the surrounding tropical floral by introducing extensive roof gardens, landscaped sky terraces, cascading balconies and lush green areas. The architectural design also incorporates sustainability features through careful environmental analysis of sun, wind and micro-climate conditions on site and the integration of low-impact passive energy strategies. Water bodies have been strategically placed within wind corridors as a means of allowing evaporative cooling to happen along the wind paths, reducing local air temperatures and improving thermal comfort in outdoor recreation space. World Architecture Festival Director Paul Finch praised the project, saying ‘The Interlace is blazing a trail with an example of bold, contemporary architectural thinking. The project presents an alternative way of thinking about developments which might otherwise become generic tower clusters’. 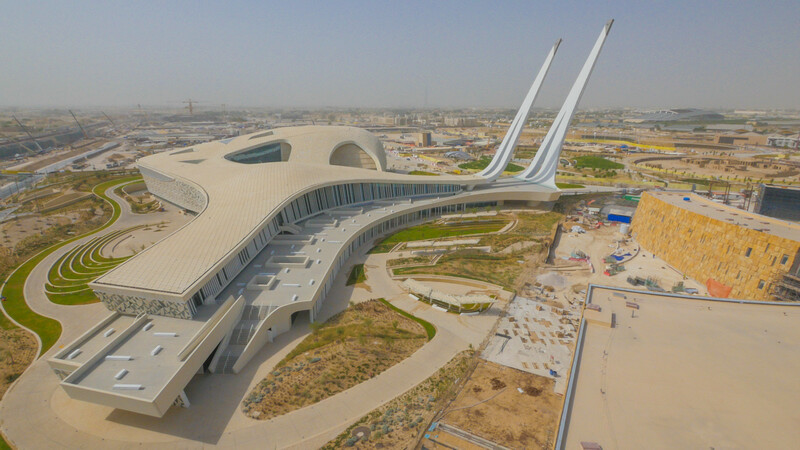 Qatar Faculty of Islamic Studie s is ‘a school and prayer place pushing the boundaries of traditional Islamic architecture’. A space dedicated to research and debate about Islam, the architects employed geometric patterns, developed as an interpretation of traditional Islamic designs. The building corridors display relief panels depicting the beauty of elements of the architectural heritage of the Muslim world, and all interiors have visual or physical access to gardens. Calligraphy wraps around the central courtyards and minarets in a manner consistent with the overall architectural design. The mosque has a capacity of 1,800 worshippers in its main prayer hall. The two minarets stretch up to 90 m into the sky; in its strategic position at the main entrance to the city campus, the mosque has quickly become the new highlight on Doha’s remarkable skyline. The box-like temporary structure expresses the identity of Brazil in an unconventional way, drawing on the ideas of play and discovery. 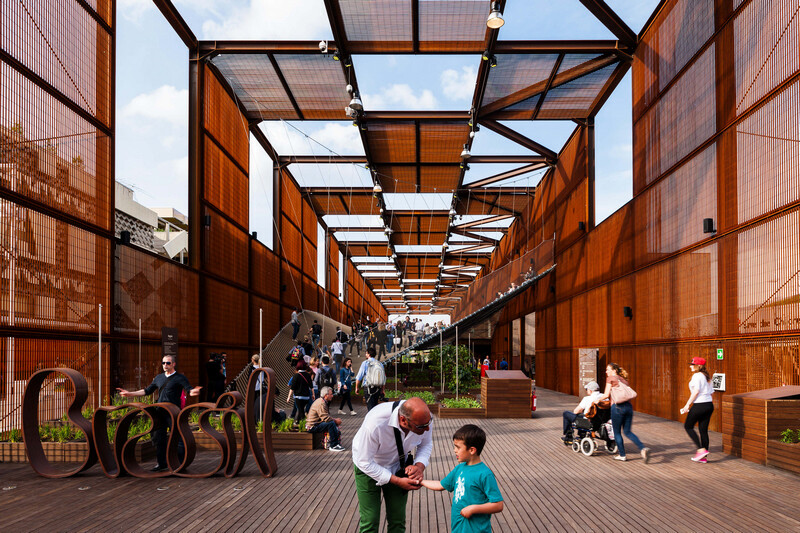 It aimed to combine architecture and scenography in order to provide visitors with an experience that would transmit Brazilian values and the aspirations of its agriculture and livestock farming according to the theme “Feeding the world with solutions”. More than a temporary building, the sensorial immersion includes leisure, high technology information, interaction and learning. Sino-Ocean Taikoo Li is the living urban heart of future Chengdu. Set in the context of the Buddhist Daci Temple, the low-rise, project provides a unique mix of shopping, dining, drinking, entertainment, live performance, workplace, and hotel accommodation in an exciting and enjoyable setting of lanes, squares, streets, alleys and courtyards. Interwoven into this master plan for urban regeneration is the strategic conservation and adaptive reuse of six preserved buildings and ancient lanes associated with ancient Daci Temple at the hear t of the development. 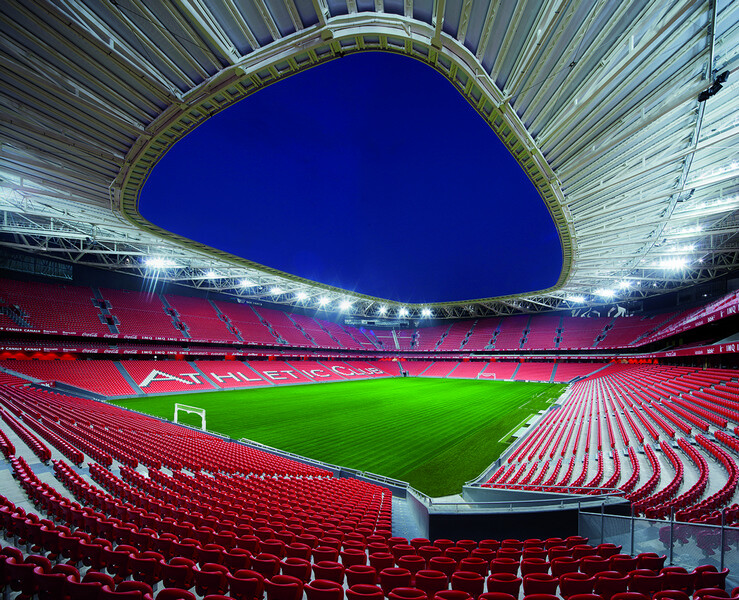 San Mamés Stadium is a ‘truly local stadium for its local club that is the beating heart of the city’. The home of Athletico Bilbao, the stadium was conceived as an urban building for the community rather than a mere sports facility. The previous stadium, over a hundred years old, was popularly referred to as the cathedral of football. Located practically in the same place as the existing one, one of the main challenges in the design of the New San Mames was maintaining the intense and magical football atmosphere of the old Cathedral. The stadium has ample hospitality, dining and meeting areas and its capacity now exceeds 53,000 spectators. 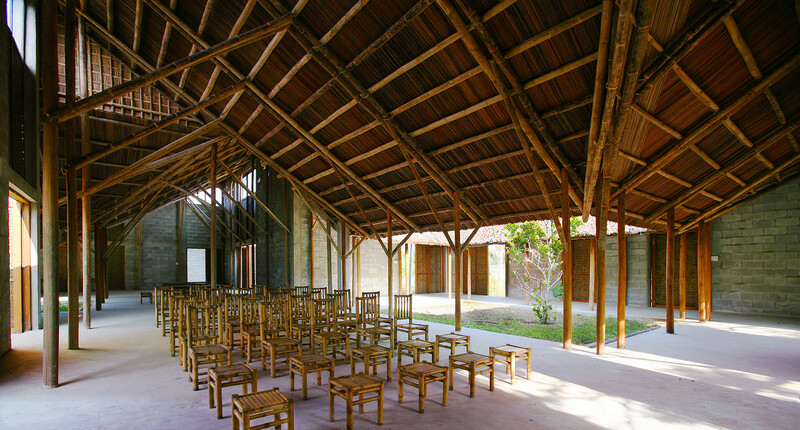 The Cam Thanh Community House features bamboo roofs thatched with coconut leaves, which pitch inwards to direct rainwater towards a series of planted courtyards. 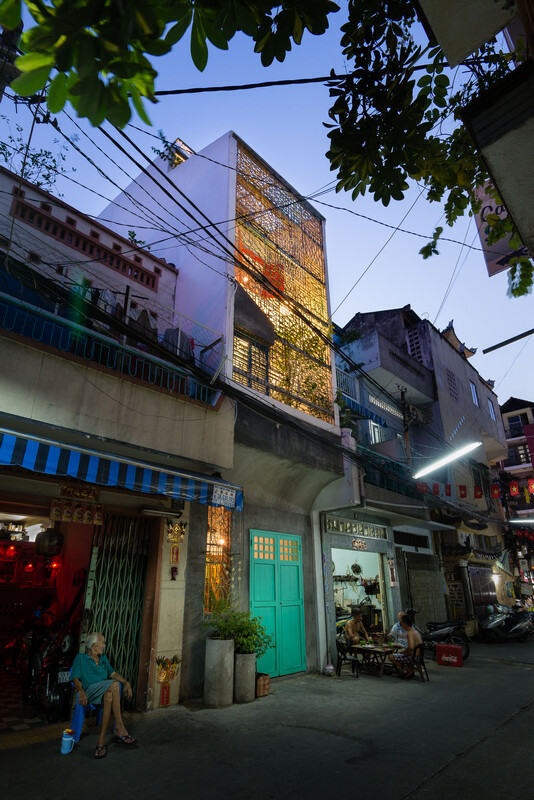 Built in the rural Cam Thanh Commune of Hoi An town, the centre includes three buildings, providing a continuous zoning flow. By using flexible partitions, the space can be modified to adapt to different requirements: meetings, exhibitions and events, and training courses, combined with a library and cafeteria. Cam Thanh comprises a series of small villages set among mangrove and coconut forests and crisscrossing waterways, and is regularly affected by heat waves and typhoons. The Ballet School was created between two existing structures, a cinema and a neighbouring home. The school’s design ‘re-establishes a series of heritage buildings using a restrained palette of materials contrast with the early Russian industrial aesthetic of the gritty area’. The project includes two new buildings – teaching and dormitory blocks. 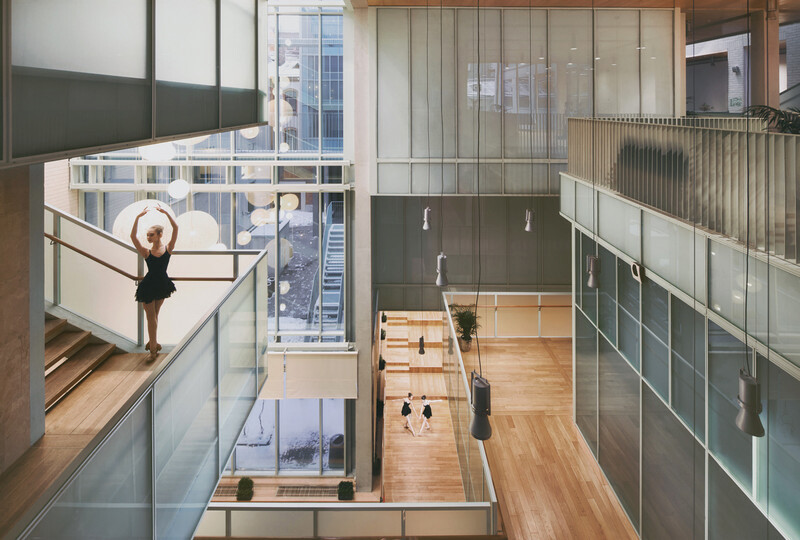 The space between the new volumes is interpreted as an atrium, where recreation spaces co-exist with ballet classrooms. The walls of recreation spaces and ballet classes are realized in semi-transparent glass, which serves to flood the building with natural light. 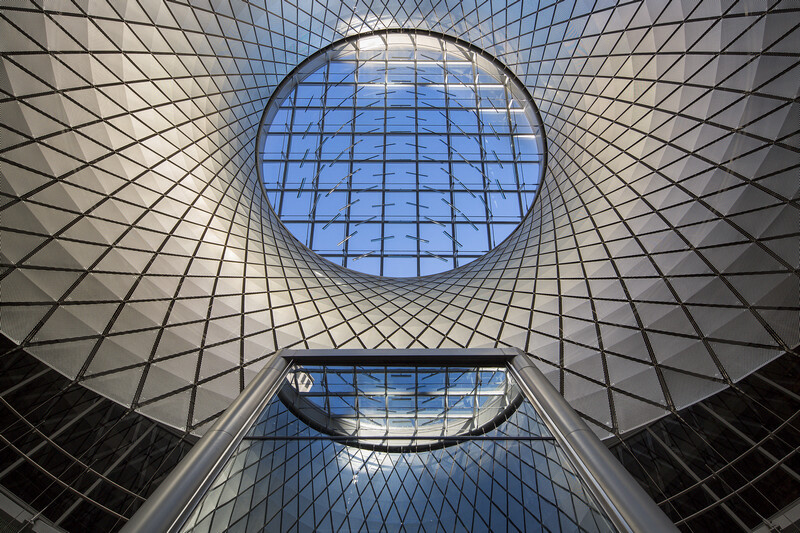 The Fulton Center in Lower Manhattan is a dynamic transport environment streamlining connections between eleven subway lines handling 300,000 daily passengers. Organised around a large-scale 33.5m atrium contained within an elegant, transparent façade, the centre draws inspiration from the neighbourhood’s cast iron buildings and incorporates the restored 1888 Corbin Building. Carefully aligned entrances allow the streetscape to permeate the building, offering clear and efficient pathways to the train platforms below. Once underground, passengers encounter brighter, widened passageways, new elevators and clear signage. The Fulton Center fulfils a significant civic role, offering a memorable urban experience that nods to history while supporting the region’s growth. Held in Singapore in early November alongside World Architecture Festival, INSIDE is a golden opportunity to be inspired by the latest and greatest in global interiors. Over three days INSIDE shone a spotlight on the people, projects and developments that are changing the face of global interiors. Finalists that are shortlisted across nine categories presented their project in person to international judging panels. The category winners then went head-to-head before a super jury, which includes luminaries such as Matteo Thun and Sadie Morgan. Hotel Hotel, a contemporary hotel in Canberra, Australia, has been named as the World Interior of the Year for 2015. The project by March Studio beat over 100 nominees across nine categories to be named as the best global interior of the last tw elve months. Located in NewActon, a diverse new precinct in Canberra, Hotel Hotel is part of a wider scheme that encompasses offices, residential apartments, cafes and a cinema. The signature design of the new hotel is a fragmented lobby entrance, which provides a unique identity for the building. A series of fractured timber pieces line the walls and furniture to create a tunnelling effect that leads guests from the reception through to the main areas of the hotel. At the centre of the hotel lies a grand staircase that services the two floors of accommodation and creates a focal point at the end of the fragmented entrance. The judges described the project as a “masterful integration of different spaces into a seamless and delightful interior”, noting that the thoughtful and innovative design has helped create a “Bilbao effect” which has rejuvenated the area. On the following section is a selection of competition entrants from 2015’s festival. 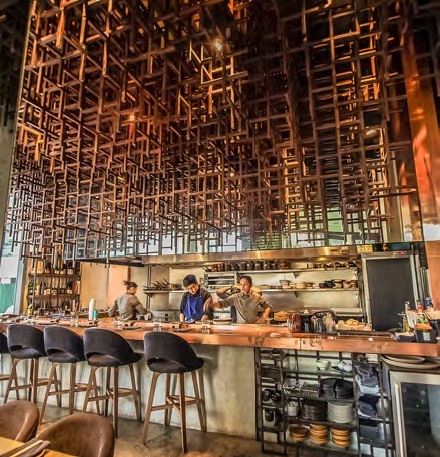 Mecha Uma is a culinary venue of a young, self-taught chef who performs in his 64 square metre restaurant for two sets of ten diners each night. The kitchen is open to a copper-surfaced bar-height counter bringing diners and chef to the same level. Interior elements are raw and include concrete, steel, copper, glass and wood. Long steel spokes hang overhead, designed to ‘manipulate human cognitive imperfection’. A mirror over the counter magnifies the illusion as an alleg ory of the creative chef ’s mind at work. Lead Architect/ Designer: One Plus Partnership (Hong Kong) Ltd. Upon entering the cinema, black and white engulfs the perimeter, conveying a hint of the futuristic and the solitary feeling often found in disaster movies. Rectangular-shaped concessions and kiosk inclined with assorted angles, camouflaging themselves in the disaster background, which triggers the association of meteors in space or debris after chaos. On the ceiling above the concession lays a rectangular LED box, which could play movies or dynamic graphics within the area. Black marble tiles with white veins cover the entire floor space. 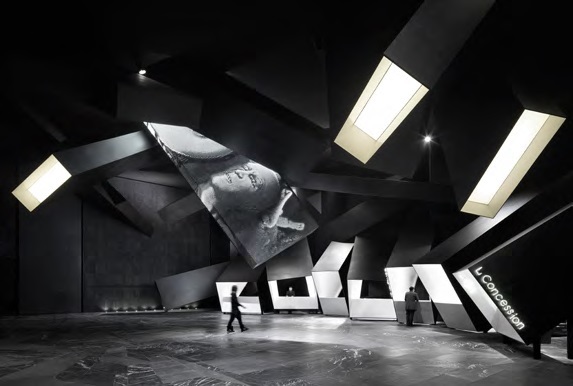 The flooring, which is supposed to be a two dimensional object, fills with three dimensional geometric graphics, as if they are multiple rectangular boxes emerging from the ground. United Imaging Healthcare is a leading company in China which designs and manufactures high-end medical equipment. The entrance of the showroom is an important opening of the sequence of spaces. Using the original height of the architecture, Hallucinate set up a prolonged passage by adding an italic wall to enhance the narrative emotions of the entrance. Exiting the passage, the open and bright core area of the showroom appears. Anodized aluminium circular columns embedded with LED screens serve as a tool f or sharing related information. Lead Architect/ Designer: Specialnormal Inc.
Kabuki Gate has two features: an interactive gallery, which aims to disseminate the world of Kabuki, a traditional Japanese performing art, to the world; and a shop selling original goods and select products associated with Kabuki. This new concept facility opened at Narita International Airport Terminal 1. On the surface of wooden vertical lattices at the interactive gallery side, symbolic Kabuki colours – black, yellowish brown and light green-, which are commonly used for Joshikimaku, a tricolour Kabuki theatr e curtain, were applied. New headquarters building in Milton Keynes provides flexible and agile working spaces and a new style of working for the company’s 800 staff. A theatre style conference centre, business lounge, restaurant and a ‘Kombi café with its own tailor made Kombi VW van, all surround a dramatic full height atrium. 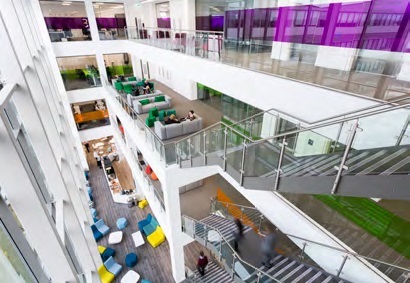 The atrium provides a central hub for the building allowing for staff collaboration and movement. The office design reinforces the Volkswagen Group brands and represents modernity, development, productivity and design. The brands are present throughout each floor with a chosen colour theme and a number of bespoke art installations including spectacular three dimensional pieces. This winning competition entry is for an environment to study the future of sustainable cities and places of habitation. 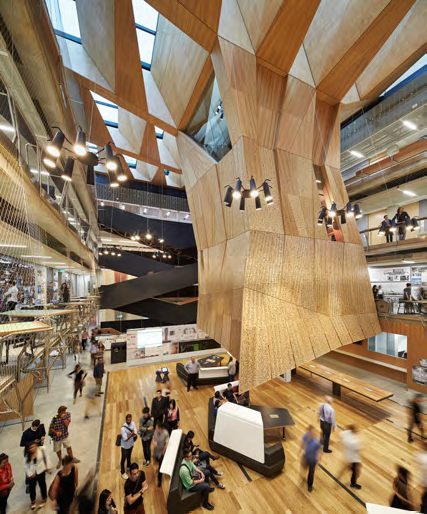 Within this building the next generation of architects, urban planners, ecologists, builders and landscape architects learn to work in a highly connected way. The dynamic environment becomes a point of stimulus, a catalyst for creativity and inventive design research. With its many inventive structural and environmental ideas, the building becomes a live learning tool for students and staff alike. The transparent facades and open permeable ground plane reveals the creative and collaborative activities to the r est of the university community.